The very thing that makes wide-angle photography so compelling also makes it a challenge: While you’re sure to capture a vast scene using a wide-angle lens, it can be difficult to direct the viewer’s attention when so many elements are included in an image. For many photographers, the results of their wide-angle attempts are a disappointment and they just can’t seem to achieve that “Wow” they are hoping for in their images. Whether you’re new to wide-angle lenses or you’ve been frustrated by them for a long time, expert photographer, teacher, and author Chris Marquardt is here to help. 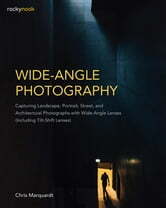 Wide-Angle Photography is packed with information—as well as beautiful and inspiring photography—that will help you take your wide-angle image making to the next level. In a friendly, accessible manner Chris walks you through in-depth discussions of both the advantages and the pitfalls of wide-angle photography, the fundamentals you need to know, composition and design principles, and the specific genres in which wide-angle lenses can be used to create outstanding images—not only for landscape photography, but for portrait, street, architectural, and interior photography, as well. Throughout the book, Chris offers hands-on exercises that drive home the concepts being taught so you can learn by doing. Chris also dedicates two full chapters to tilt-shift lenses for those who are interested in exploring and maximizing the fascinating capabilities these kinds of lenses offer.